Kane Williamson: Made most of an early reprieve. The 27-year-old world No 3 batsman, who will be around for most of the second half of Yorkshire’s 2018 campaign, playing 11 T20 Blast matches and four County Championship fixtures, made the most of a first-ball reprieve, hitting 72 and leading New Zealand to 196-5 in the tri-series T20. Williamson should have been run out without scoring as he dashed for a risky single but paceman Mark Wood missed the stumps from close quarters. The Blacks Caps captain never looked back, striking four fours and four sixes to form the backbone of the home side’s total. Opener Martin Guptill had earlier feasted on some inconsistent bowling, setting the tone while Williamson found his feet to score 65 off 40 balls. 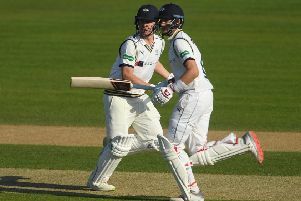 As well as his errant throw, Wood had an evening to forget, shipping 51 runs from four overs despite picking up the wickets of Colin Munro and Mark Chapman. Chris Jordan produced a remarkable one-handed catch on the boundary to see off Colin de Grandhomme for a golden duck. England were without captain Eoin Morgan for the second game in a row, the Dubliner failing to recover from a groin complaint, and made two changes to their attack, with Wood and Yorkshire’s Liam Plunkett replacing Tom Curran and Liam Dawson. In reply, Dawid Malan struck 59 off 40 balls but England were pegged to 184-9, Yorkshire’s David Willey striking 21 off 10 deliveries. Defeat leaves qualification out of England’s hands. They face New Zealand in Hamilton on Sunday, two days after the Black Caps tackle Australia, who have already qualified for the final.